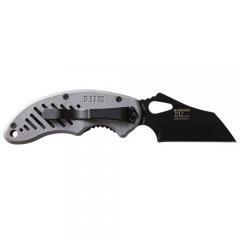 The Wharn for Duty Plain Edge Folding Knife from 5.11 Tactical is a sleek, ultra-durable tactical knife ready to handle any task thrown its way. Featuring a modified Wharncliffe-style blade and an ergonomically designed handle, the knife is optimized for maximum cutting power with minimum maintenance. The blade employs a flat cutting surface that ends in a reinforced tanto tip to deliver precession cuts with maximum piercing strength. The blade's tactical shape makes it easy to sharpen while its AUS-8 steel construction ensures maximum edge retention. The handle features a slight curve that follows the natural bend of the hand while two finger grooves keep the knife secure and provide maximum control. A textured exterior and skeletonized surface provide added gripping strength for a secure hold with or without gloves.